There's a reason why eating a pomegranate makes you feel like donning a toga and Birkenstocks. This gorgeous food is associated with the most ancient civilizations in the Middle East, specifically Iran and the surrounding area. Once it arrived in Greece it became one of the first cultivated foods in the world. The pomegranate express passed through India and China next, and then on to the Mediterranean where it grew especially well in the dry heat of Spain. Spanish missionaries brought pomegranates to the New World after Cortez conquered Mexico in 1521, and as the missions began to dot California, so did pomegranate trees. It's amazing that we don't see more of these tough-as-nails trees. This is an ideal choice for home gardeners who want an interesting, super easy tree with tasty fruit. Not surprisingly, it relishes hot, dry regions such as California's Central Valley — especially if you want to pull out its maximum sweetness. Doesn't get to 105 degrees all summer in your neighborhood? It's also an outstanding 15- to 20-foot ornamental shrub or tree for sunny but cooler areas, sporting brilliant orange-red flowers in summer, followed by leathery red globes and yellow foliage in the fall (and no leaves in winter in dessert and interior regions). I have a friend in Kentfield whose entry is graced by an artfully pruned and placed pomegranate. In addition to providing year-round interest, it is also a point of conversation for passers-by. I have one that's mixed in a hedge that I've left pretty much unpruned. It's become a tall shrub that's a perfect screen between my house and my neighbor's. I water it with drip irrigation and simply leave it alone. It's a nice surprise every October to see those dangling globes waiting to be plucked. Pomegranates aren't as picky as many other fruit trees when it comes to soil. They like loam best, but sandy or clay soils will do. They even tolerate some slow drainage and alkaline soil, but growth, fruit, and yield will suffer. They appreciate a little extra nitrogen fertilizer in fall or winter. Consider planting fava beans underneath for a little nitrogen boost. As an added bonus, they are pest resistant, often laughing off coddling moth and twig borers. Given its hometown address, it's no surprise that pomegranates can withstand long periods of drought — but don't expect much fruit. But here's the magic: if you start watering a pomegranate that has been subjected to many years of neglect and drought conditions, it will spring back into action and say thank you by producing an abundance of fruit. How cool is that? 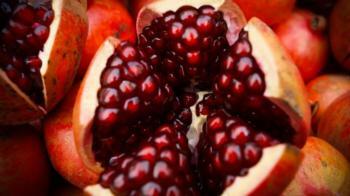 Pomegranates do not appreciate summer rain, which tends to soften the fruit. Not that this is a big concern around here, of course. Your best bet to optimize flavor is to keep soil moist during the growing season and into fall to avoid split fruit. Water as you would a citrus tree and harvest a few weeks before full maturity in October, and definitely before the rains come, which usually results in split fruit. They last for weeks and will even darken and redden at room temperature. But you probably already know that, because there's a good chance you've popped a few in a bowl as a decoration somewhere along the line — yet another use for this versatile, delicious, healthy food. If not, toss a few in your shopping cart next time and enjoy this exotic fruit while it's in season. Nurseries often carry pomegranates. 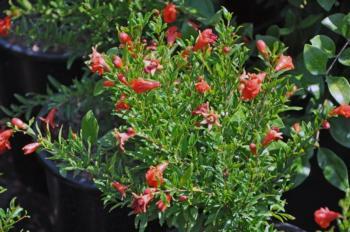 Varieties to consider include Wonderful, which is the most commonly grown, Ambrosia, Eversweet, Granada and Ruby Red.